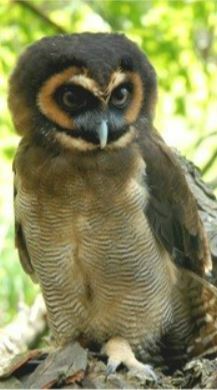 The Brown Wood-Owl is a medium to large owl which ranges over much of South Asia. With no ear tufts and dark eyes. The upper-parts are barred with dark brown and some white. Its crown is dark brown with a partial white facial disk and dark rings around the eyes. The chest brown becoming paler towards belly with fine dark barring. The wings are long & broad, the tail rather short, the legs rather long, stout, and densely feathered, and the plumage is exceptionally soft and dense. Most owls are cryptically coloured in shades of brown or gray, variably spotted, streaked, barred, or mottled. Female is usually bigger than the male, but sexes are otherwise similar in appearance. Where they originate from they are a very secretive bird and very rarely seen Owls are raptorial, mostly nocturnal, big headed birds with strongly taloned feet, round facial discs of feathers, and large, forward-facing eyes.